Vee Rubber is a Thailand based company that was formed in 1977, starting as a manufacturer of bicycle and motorcycle tyres. It now sells its tyres throughout Asia, Western Europe, USA, Canada, and Latin American. Vee Rubber employs over 4000 people and is known worldwide. The Group also supplies several Japanese motorcycle manufacturers for OEM and replacement sales. 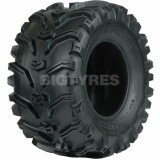 Vee Rubber Group produces tyres in all sizes ranging from small go-kart up to large commercial tyres. It specialises in quad sport, utility & racing tyres, but also produces a full range of passenger tyres for cars, pickup trucks, vans, and 4x4 use. Vee Rubbers tyres are made using modern manufacturing technology and processes. All of the groups products are of the highest quality, and Vee Rubber’s reputation in manufacturing and service is well recognized in all major markets. The company has received Awards and certifications from many regulatory agencies such as the U.S. department of transport (DOT). The Vee Rubeer VRM-189 Grizzly tyre features an open tread pattern that delivers improved performance in softer conditions, such as mud, snow and sand. The VRM-189 also has a dimpled knob design for expanded traction on harder dryer conditions. The center knob helps improves ride on harder terrain conditions and the heavy 6-ply rated construction works to resist sidewall perforations and assists in stability and control whilst manoeuvring. The open tread design of the Grizzly VRM189 clears itself of mud for superior control, and the large sidewall lugs provides traction in deep ruts. The Vee Rubber Grizzly offers the handling of a trail tire with the performance of a mud tire and is available in all popular ATV sizes, including sizes for the popular Kawasaki Mule vehicle. 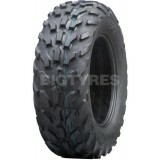 The Vee Rubber VRM-326F Tyre is designed for trail riding in mixed terrain. It has a resilient 4 ply carcass and the Vee Rubber VRM-326F Tyre is made from a durable rubber compounded to ensure good wear and tyre life.